Janice and I like to avoid doing the same thing over and over again. So for this year's August portion, we decided to rove where we could reach out to several different pockets of activity. 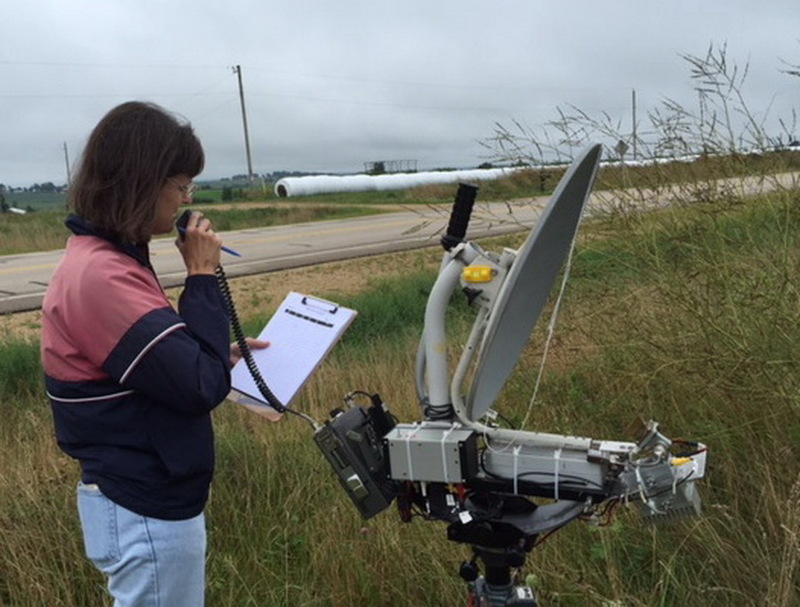 We picked the SW corner of Wisconsin and NW corner of Illinois thinking that we could reach out to W9SZ who would start his travels near Champaign, IL; make easy shots to the Chicago area; possibly reach the Twin Cities on Buck Hill; reach any rovers active in Iowa; and the biggest goal was to reach out to St Louis area operators like AF4JF and KO0Z. In the week leading up to the August weekend, I sent out email promotion to all the known and prospective players in the region. I figured that by knowing people's plans, each of us could pick operating behaviors that maximized opportunities for additional contacts. As part of the email promotion, I whipped up the graphic above to give folks an idea of what activity to expect. Before the weekend began, there were two unfortunate cancellations. Mike, AA9IL, and Ron, KO0Z, both had to cancel for family emergencies. So that decreased the universe of stations within range. On Friday night, Janice and I traveled from the cabin in Hillsboro, WI to Dodgeville, WI and checked into a hotel. That way we'd only have to travel about 15 miles to be at our first operating spot on Saturday morning. Janice and I knew to expect rain but our reading of the forecast indicated that most of the precipitation would pass north of us. Our Saturday began with low clouds but no rain. Mid morning, at our 3rd stop, we had two brief rain showers but that was all. After that, the rest of the weekend was spectacular. 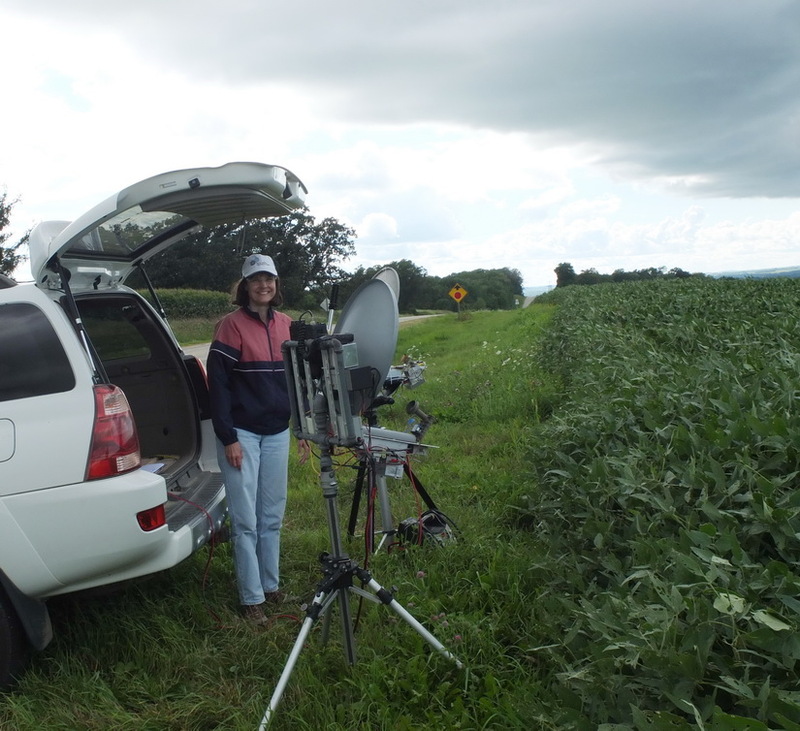 At our second stop (EN42us)(not shown) we successfully worked K2YAZ at EN74av with some rainscatter assistance. This was our longest distance of the August weekend at 421 km. Our operations from EN42vm show some of the challenges of terrain and vegetation. 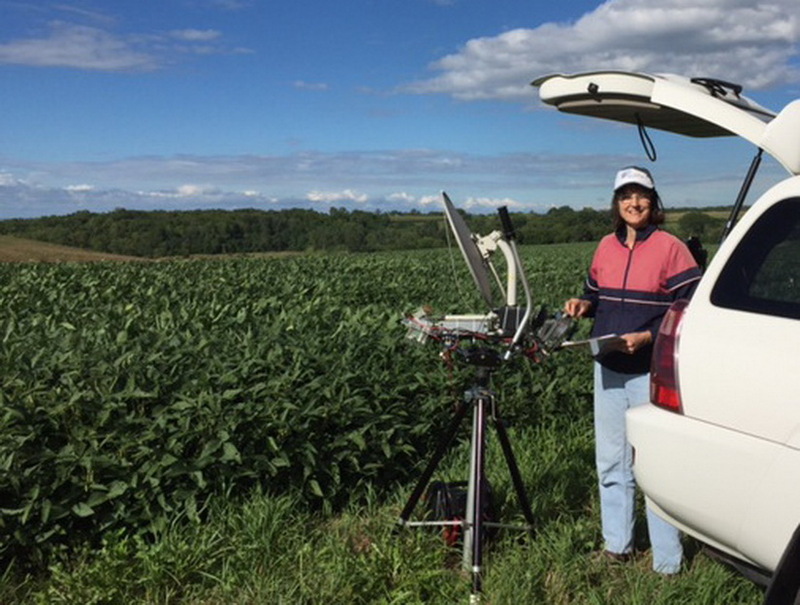 In this 2.5 by 3.5 mile subgrid, we set up four different times to point in four different directions. 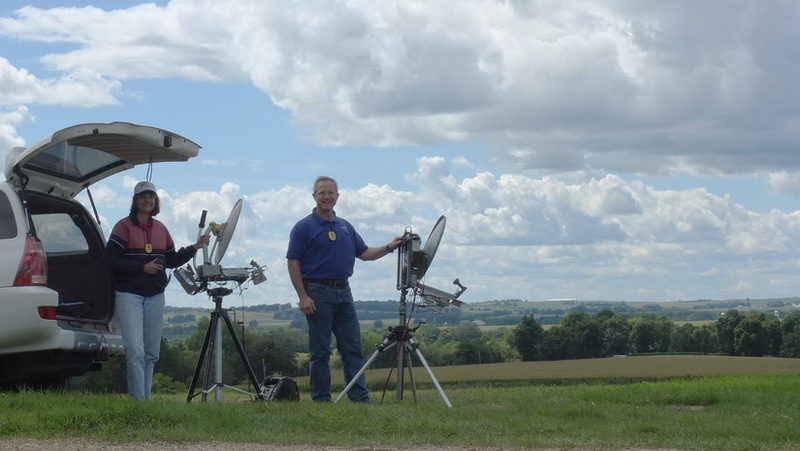 These first two pictures have a view to the southeast towards W9SNR, W9SZ, and W9ZIH. 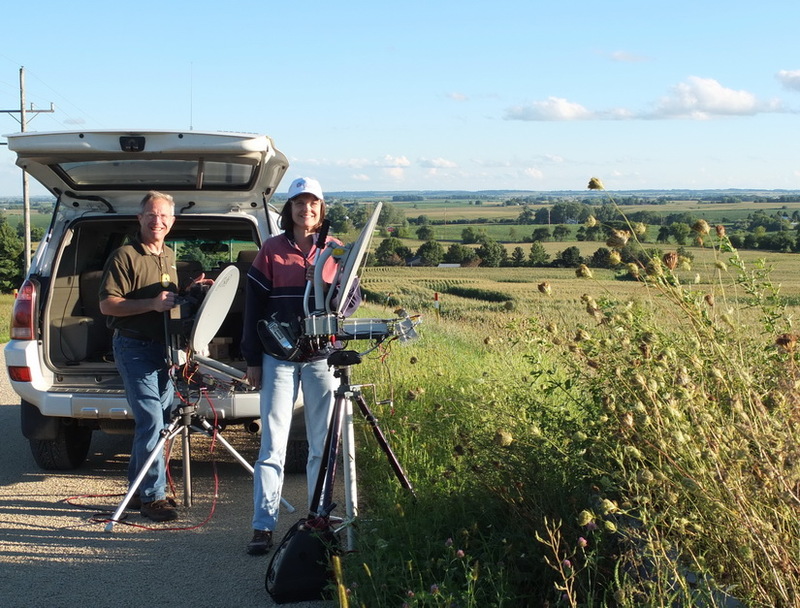 Later we found a spot with a view to the southwest to work AC0RA and KC0SKM. 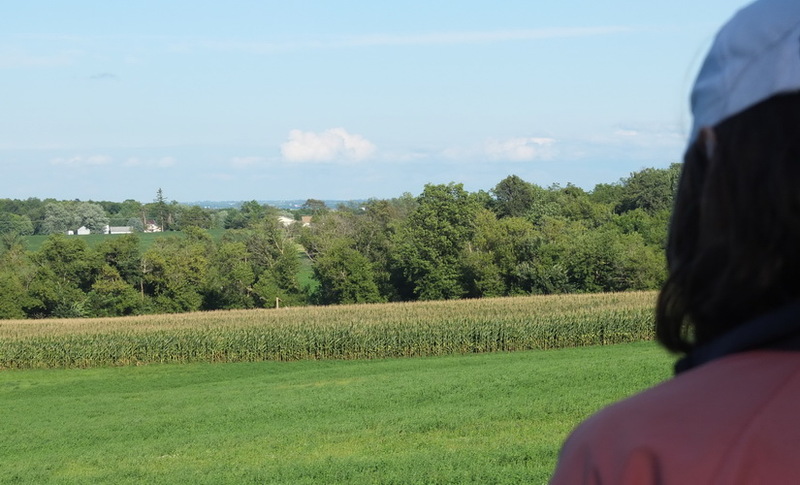 We spent quite a bit of time at the location that had a northwesterly view towards Buck Hill and the Twin Cities. That is where two rain showers hit us and slowed us down. But after it turned sunny, as seen in this last photo, it stayed nice the remainder of the weekend. Lastly, we found a spot with a view to the northeast and K2YAZ. Although we took turns beaconing back and forth for over a half hour, we were unsuccessful working Bob, K2YAZ. This is at Waddams Grove, IL (EN52bj). 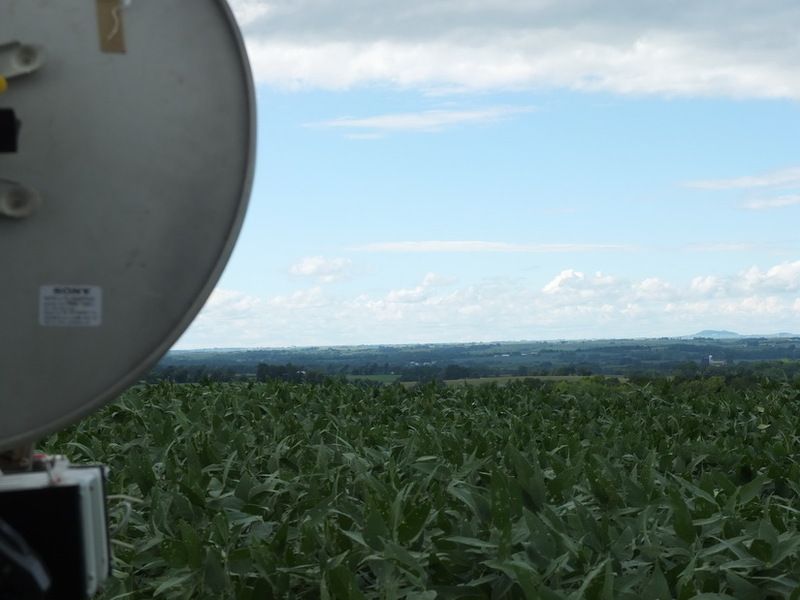 We needed to find a good view to Jim, W9SNR, who was at EN62ad--only 131 km away. These first two are views in that direction. This last picture we moved about 400 yards south to the other side of the highway and it had a great view from southeast through to west. Perfect for working AC0RA and KC0SKM who were now in EN332fi at 302 km away. This was the end of Saturday for us. We proceeded to Freeport, IL and checked into our hotel. Then we had a nice Italian dinner before hitting the hay. Here we are starting Sunday morning just south of Freeport, IL near a place called Baileyville (EN52fe). As is often the case, there is some coordination required to get going. 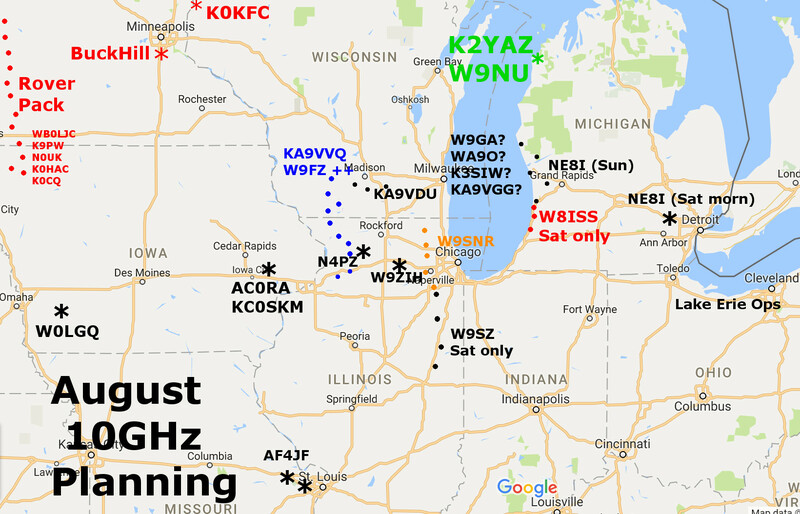 This is a view towards the Chicago area and W9SNR, W9SZ, and W9ZIH. 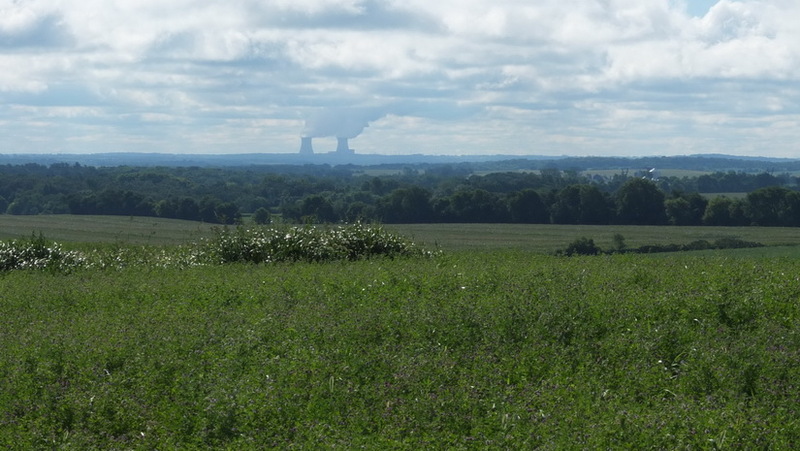 That's the nuke plant at Byron, IL in the distance. This is Sunday and I think EN52ch. This was a 390 km shot to Buck Hill in the middle of the day. It's turned into a very nice day. Late on Sunday, we got word that Greg, KC0SKM was looking for just one more place to work us. So we found a spot that had a good view in the direction we thought he was. He has a funny or wry story about how he had earlier found a good spot but noticed he had NO cellphone service. So there was no way to tell us he was ready. He took down and started to head home and when he got back in cellphone coverage, we discussed it. He pulled over and found a new spot with a view in our direction. Then KC0SKM said he was ready from EN32vq. Well, the path to him was right between the two buildings across the road. We were successful at 178 km. We also had one final contact with the two operators still on Buck Hill at 340 km. 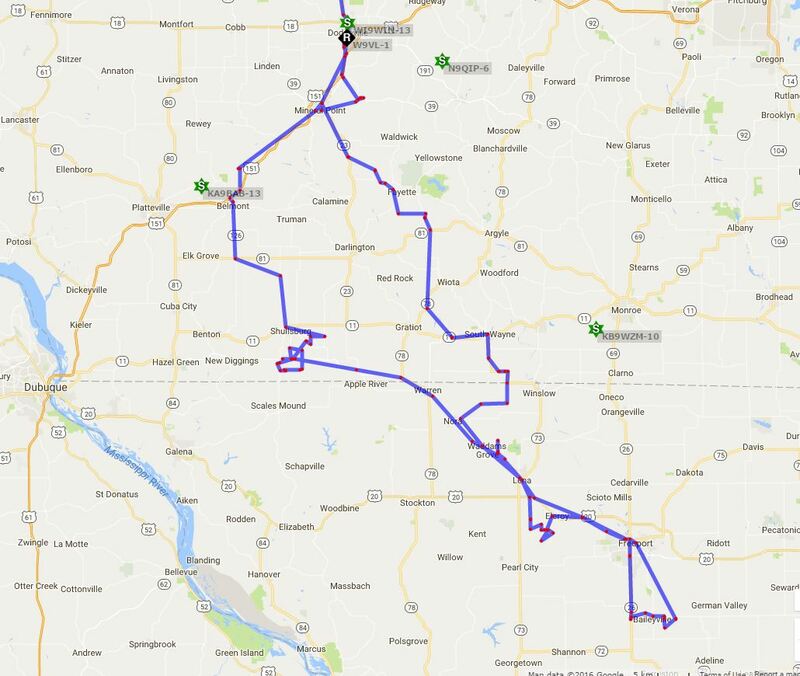 Here is the "track of chirps" from APRS of the entire weekend. Started at the north end at Dodgeville, worked southward on the western track. Our original plan was to work well south of Freeport to get closer and closer to AF4JF. When we found that he had to take down and get ready for a travel trip the next day, we started working back to the north along the eastern track finishing near Dodgeville again. 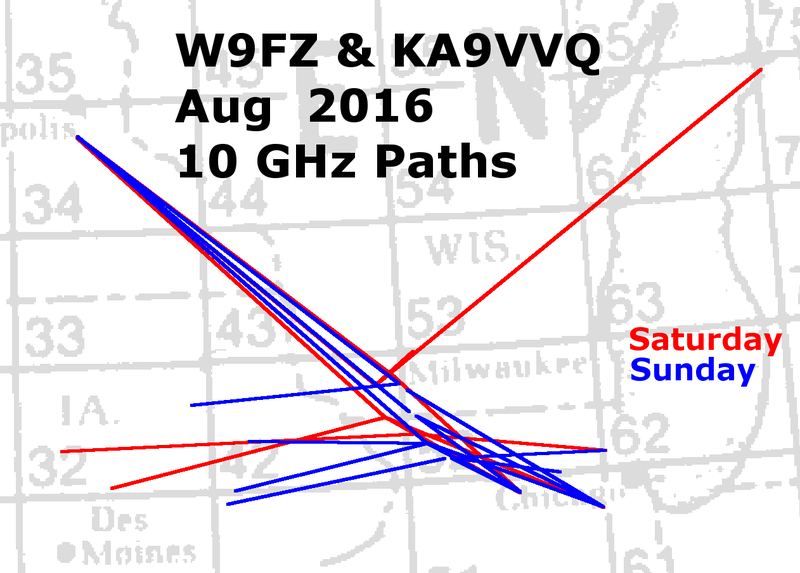 Here is a graphic of the paths Janice and I worked over this August weekend. 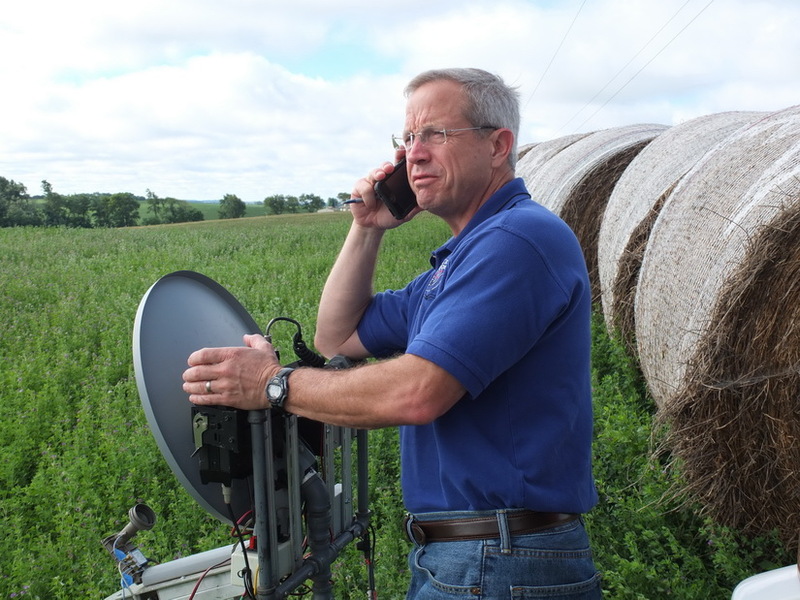 One highlight was connecting with K2YAZ (EN74av) while we were in EN42us (near Dodgeville, WI) on a 421 km connection. 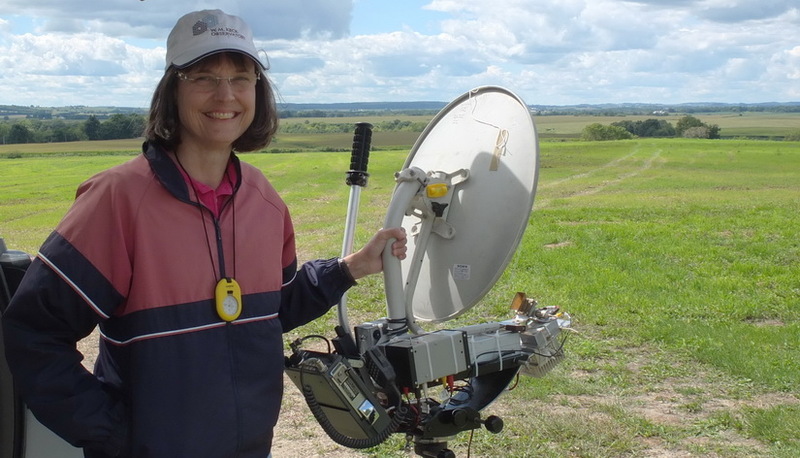 Another was connecting with Buck Hill (EN34ir) from EN52an and EN52ch for 361 and 390 km shots. This August trek, although it started with clouds and drizzle, was filled with beauty. 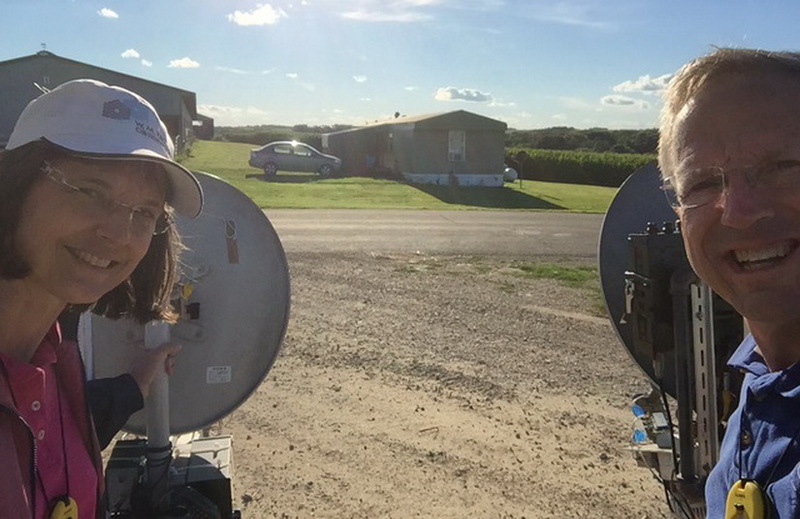 I made a GoogleMap of the locations we operated on the August 10 GHz weekend. 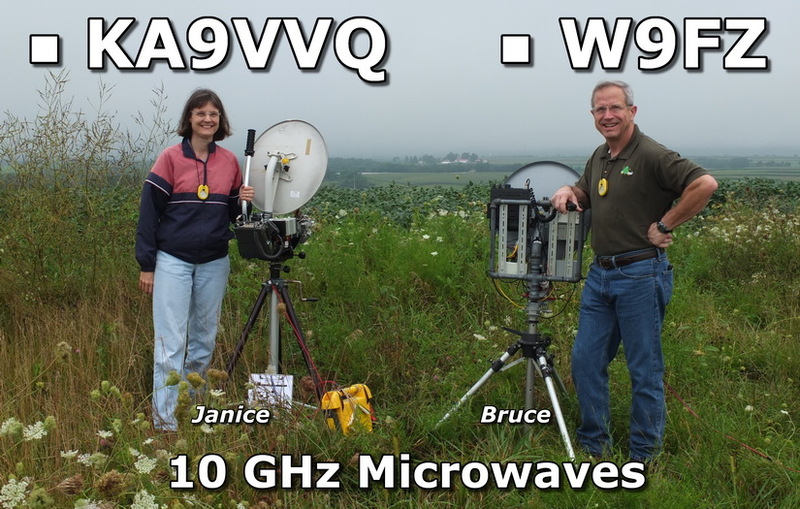 I placed the markers carefully and hopefully this map will help others who go to this area for 10 GHz. 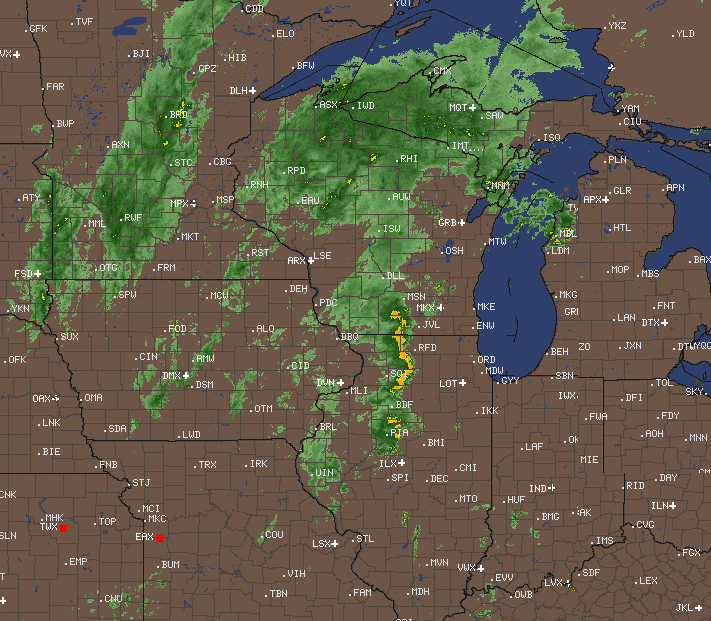 Admittedly, those fields that were soybeans this year may be corn in a future year. Plan on Eclipse-O-Mania! 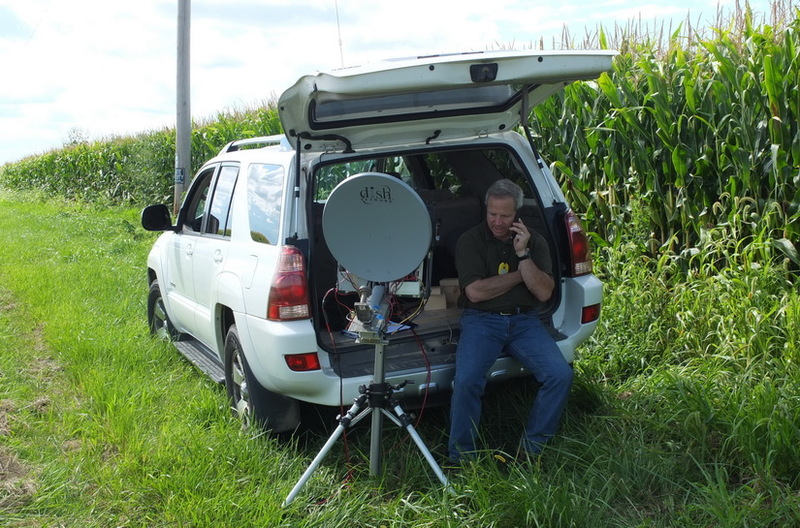 on the August 10 GHz weekend in 2017!